American scientists are the world’s energy pioneers. For the past century, their research has positioned us to lead on virtually every energy technology, from solar panels to clean coal. We can cement this legacy with commonsense reforms that enable and inspire American ingenuity. Individual national labs should be given the authority to independently engage in select private-sector partnership agreements. Currently, this authority is reserved by the Department of Energy officials. Reducing unnecessary overhead would decrease approval times and barriers to commercialization. Opening our national lab resources to companies and inventors could significantly lower commercialization barriers. The labs already have secure facilities, high-tech equipment, and thousands of expert scientists. The heads of the national labs should be given more discretion to rent their resources to the private sector. 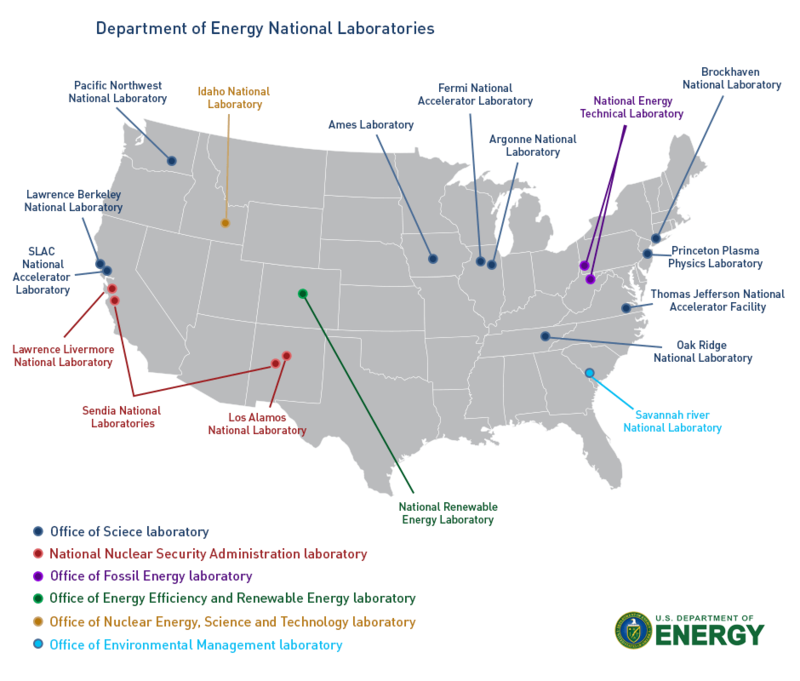 Over 50 reports have proposed solutions to the deeply strained relationship between the national laboratories and the Department of Energy.1 One of the most recent, a 2014 report by a blue ribbon panel commissioned by Congress, made over 30 targeted recommendations that should be implemented. Certainly, the Energy Department has a responsibility to hold its contractors up to high standards when dealing with nuclear and other high-risk research. The Department of Energy, however, micromanages low-risk activities as well, from human resource modules to small partnership agreements. Unnecessary layers of bureaucracy increase costs, waste time, and increase laboratory overhead. For example, some partnership contracts between national laboratories and industries take 3 to 6 months to iron out. These delays make our companies less competitive in today’s global economy. Companies have little incentive to make large investments in basic research because of high risks and unclear benefits. Often, decades are needed before the fruits of research are realized. Public investments are needed to support the American legacy of innovation — and yet, we’re falling behind China, South Korea, and many other countries. China spends more than twice as much as the United States on government energy research as a percentage of GDP. 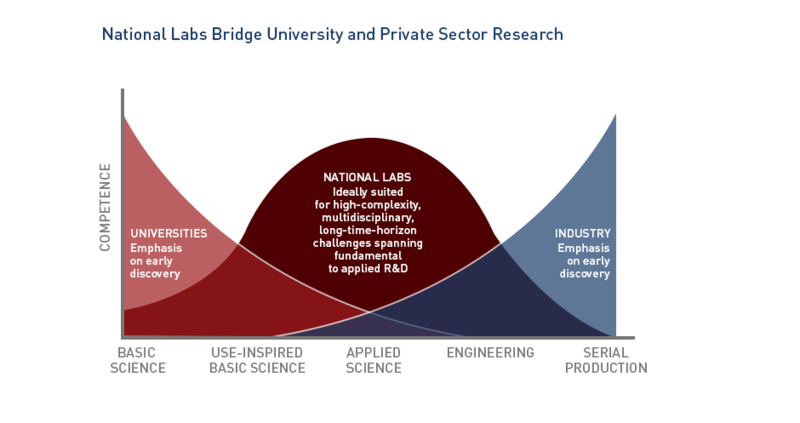 Tax credits are not the only way the government can support the private sector: national lab equipment, expertise and research can be better shared; local academics and companies can work together in cost-shared “innovation hubs”; or the government can experiment with completely new programs like the one modeled after the Department of Defense’s successful research program called DARPA. 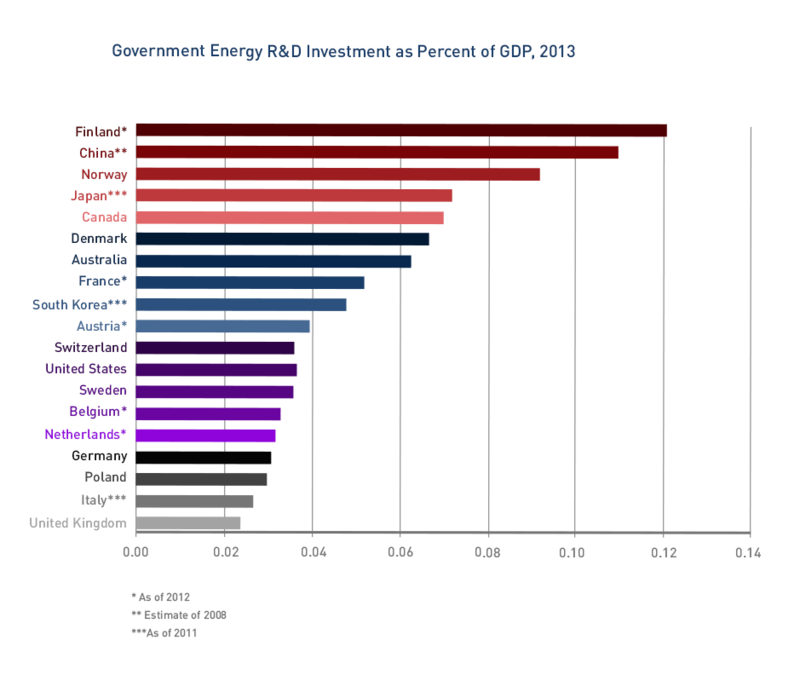 At current rates, China will invest more in energy R&D than America by 2022. Our brightest companies and business leaders are working hard to fill the void. Bill Gates is personally investing $1 billion to make energy cleaner and more affordable.11 GE is putting $15 billion into its future energy division.12 Wells Fargo13, Citi14, and Bank of America8 have each pledged multiple times more.15However, the private sector is ill-equipped to take large risks on basic science research. Basic research provides a foundation for American industry to innovative around. Like national defense and our highways, scientific research is a public good. The government should invest in public goods because we all benefit from that single investment.The private-sector alone tends to under-invest in innovation. Companies are ill-suited to conduct basic research requiring significant, long-term investments with unclear commercial applications. The private sector excels at bringing products to market, which is typically improving on existing science. The Advanced Research Projects Agency – Energy (ARPA-E) is another energy research initiative modeled after DARPA, the successful Department of Defense R&D program. It applies venture capital management techniques to potentially transformational technologies deemed too high-risk for industry-driven development. More than 45 of its projects have secured over $1.25 billion in additional private sector funding.25 Initial ARPA-e investments helped the technologies scale to the point where they attracted private capital.